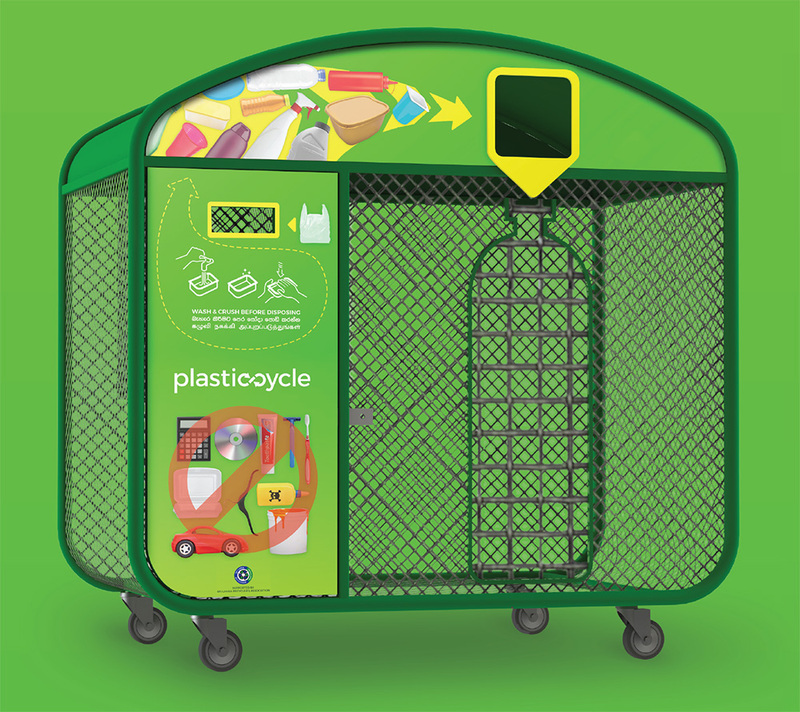 We’re really excited to be working with John Keells on their new recycling initiative, plasticcycle. We won the work in partnership with DentsuGrant a month or two ago, and since then we’ve been working flat out to create the brand, the language and information, and to get the recycle bin designed and made in time for the launch. In truth redesigning the bin wasn’t a part of the original brief, instead they were planning on using a simple, box shaped cage based on a sample used in another country, as shown below. However, we managed to pursued them that as the primary touch point for the whole project the bin warranted some design attention to make sure the user experience, functionality and overall aesthetic would be in keeping with the overall message and brand direction that we were creating. We decided to create a more ‘friendly’ and approachable design by softening the shape, which also serves to wash rain water off either side. 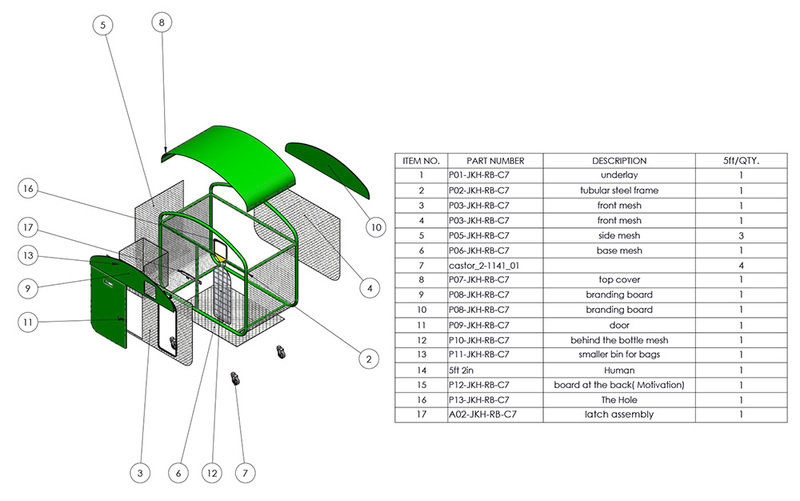 After some initial sketches, we used Solidworks to create a 3D CAD model of the bin assembly, which we used to asses the manufacturing and assembly, the overall size and form and other aspects of the design. It was also used to provide accurate dimension drawings to the manufacturers and the artworkers so that we could get the samples made. Solidworks allows us to rapidly work through design changes based on feedback from the client and the suppliers. We can also apply the graphic design to the 3D model and use that to asses the impact and effectiveness of the design. The original plan was to do a trial launch in the Colombo 2 area, but it seems the response has been extremely positive already, so now we’re on a real drive to get the recycling bins rolled out to more locations as quickly as possible. For now you can visit the Keells Super on Union place with you clean, crushed plastic and deposit it in the bin to be recycled by one of the partner recycling companies.